The chambray jumpsuit is a look that everyone is pining for these days. It is stylish and requires minimal effort to pull off. If you ask me, that is the perfect combination. I love fashion. I love affordable fashion – that’s the better way to put it. But it also has to feel good and work my figure. If I can check all those chic little boxes off my list then you have yourself a sale. If not, I move on. 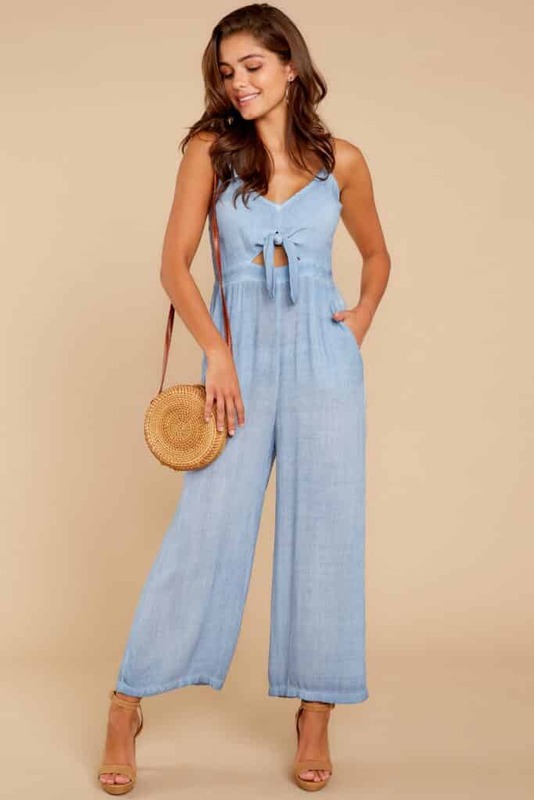 I think the chambray jumpsuit is something everyone should at least try on this year because it’s absolutely versatile and easy to pack. The perfect vacation look for sure. I bring up your next vacation because some people get shy about trying new things at home. I get like this from time to time – especially when my weight is fluctuating. I’m more likely to wear a really fun dress while I am away because that’s what a cruise or a tropical island is all about, right? FUN! But the chambray jumpsuit feels like something that belongs in between. It’s not overly dressy. I really do believe that if you are a shy woman, you can still pull it off while out to lunch with friends. Wrap yourself in a cardigan if need be. Slow steps – we willl get you there! Light Chambray features a v-neckline leading to a small cutout under a tie at bust, and an empire waist giving way to a straight cut, midi length leg with a 23.5″ inseam. 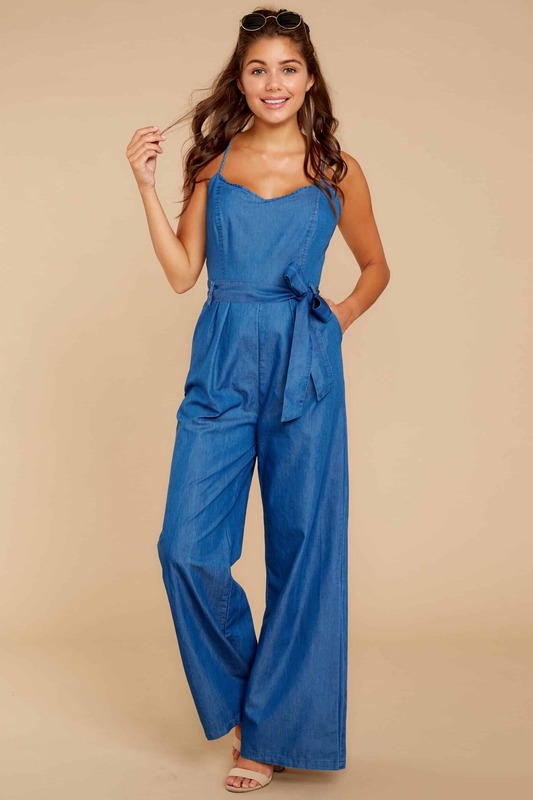 Chambray jumpsuit features a v-neckline, adjustable straps that cross in back, pockets, and wide-cut legs. Jumpsuit has princess seams, a pleated front, lower waist darts in back, an invisible back zipper topped with a hook and eye closure, and a 28.5″ inseam. Skinny strap chambray jumpsuit with 90s-inspired square neckline, straight leg silhouette, and drawstring waist. Slit pockets at hip. What To Wear With This Jean Look? This Beige Round Straw Satchel is a great neutral accessory that can work for a day event. I literally bought this tan round bag for the summer because I am obsessed with it. It hasn’t arrived yet, but expect lots of photos this year with me holding it – YEOW! I cannot wait! 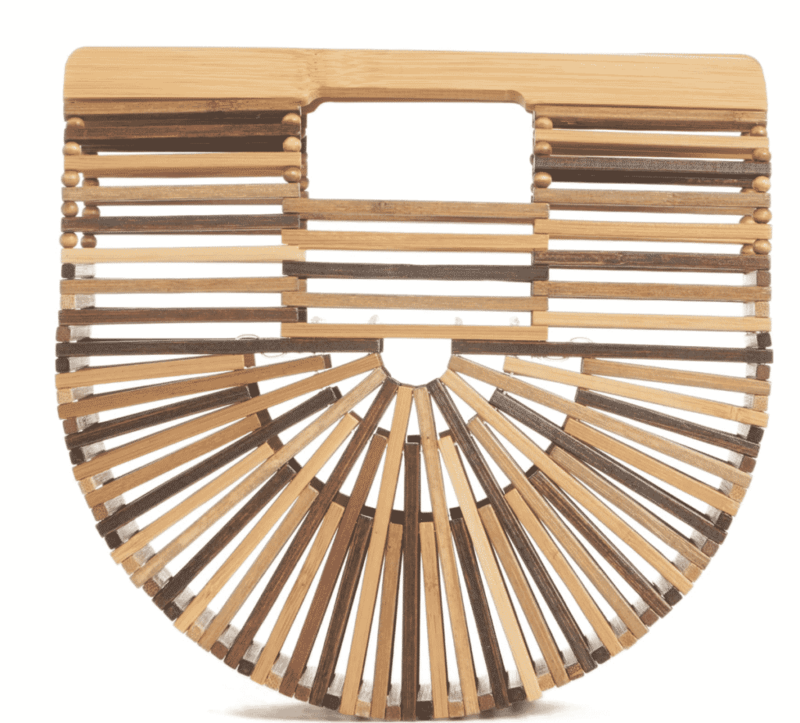 As far as evening wear is concerned, I am obsessed with this Cult Gaia bag. Personally, I think it can go from day to night. I wouldn’t consider this jumpsuit for any FORMAL event. I’m thinking of drinks with friends. Something casual but a little stepped up. You can dress up with look with the right accessories, but it certainly isn’t for anything official. As far as shoes are concerned, ankle strap wedges will do for during the day. I mean, even metallic flats would be fab! But if you ask me, I would always lean towards a heel – ALWAYS! So, what do you think? Are you willing to give this one a go? Would love to hear your thoughts.